Pennsylvania Garden is located at 251 Pennsylvania Avenue at 18th Street in the Potrero Hill neighborhood of San Francisco, California. Neighbors have worked together to create a beautiful 1-acre garden that overlooks the city and the bay. This garden is nearly all native species/xeric/drought tolerant plants and is a wonderful sight year-round. The garden is managed by the non-profit Pennsylvania Street Gardens, and is entirely volunteer driven. Please check out the Pennsylvania Gardens website for more garden information and upcoming events! For a long time Annie had wanted to clean up and beautify the Mariposa Street off ramp which lets onto Pennsylvania Avenue, and which is owned by Caltrans. Annie wanted to make it a relaxing and safe place for all sorts of people and animals to enjoy. In December 2008 she noticed that a Princess Plant (Tibouchina urvilleana) that someone had left down on 17th Street had somehow made it up to this area, and had been planted. Inspired, Annie went to a San Francisco Botanical Garden plant sale and came home with a car full of plants. Pennsylvania Garden was born. As she and her fiancee Matt planted those first plants, Jim and Carrie from across the street came over and introduced themselves - they had planted that Princess Plant! Annie met Emily nearing the garden’s first anniversary, and encouraged her to join the garden as a grant writer. 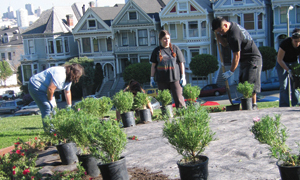 Since then we’ve gained funds to cover hardscape improvements, and gained the San Francisco Parks Alliance as a fiscal sponsor. Many other amazing volunteers have since joined and the group is taking on other greening and gardening projects in the neighborhood! Visit the Pennsylvania Gardens website.